The Sikorsky S-42 was capable of landing on water, making it possible to extend commercial air flight to locations without runways. 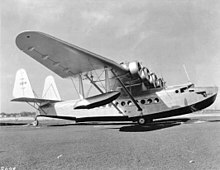 Samoan Clipper was one of ten Pan American Airways Sikorsky S-42 flying boats. It exploded near Pago Pago, American Samoa, on January 11, 1938, while piloted by famous aviator Ed Musick. Musick and his crew of six died in the crash. The aircraft was carrying only airmail and express freight; no passengers were aboard. ^ Accident description for NC16734 at the Aviation Safety Network. Retrieved on 6 October 2013. ^ Aircraft accident report from Bureau of Air Commerce, 1 April 1938.